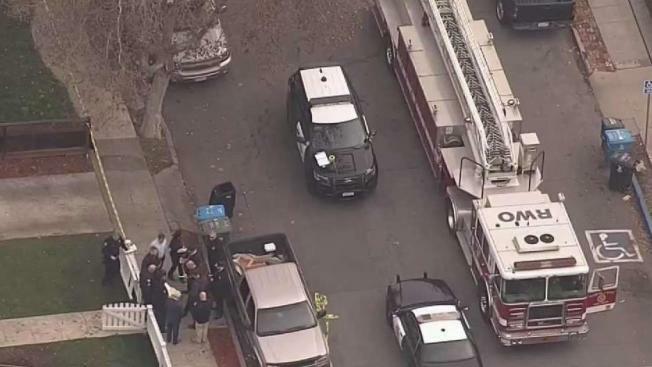 Redwood City police are investigating an officer-involved shooting Monday morning, according to the department. Kris Sanchez reports. Two Redwood City police officers will not be charged with criminal offenses in the death late last year of Kyle Hart, San Mateo County prosecutors said Wednesday. Officers Roman Gomez and Leila Velez will not be charged for killing 33-year-old Hart at his Redwood City home on Dec. 10. Prosecutors said Hart's wife called police to the home because Hart was apparently trying to kill himself. Hart allegedly charged at officers with a butcher knife and when a stun gun didn't work to stop Hart, one officer shot him. Hart died at a hospital. He was a middle school teacher in the Palo Alto Unified School District. In a letter to Redwood City police Chief Dan Mulholland, San Mateo County District Attorney Steve Wagstaffe said, "It is my conclusion that the use of force by the officers under the circumstances encountered by them on that date, which resulted in the death of Mr. Hart, was lawful." Anyone interested in reviewing the information related to the investigation is asked to get in touch with Chief Inspector John Warren of the district attorney's bureau of investigations at (650) 363-4074.